Rattle & Reward makes natural, grain-free Pet Treats that come in stylish tins. Now they want to add pouches. Rattle & Reward is David Wright's creation. 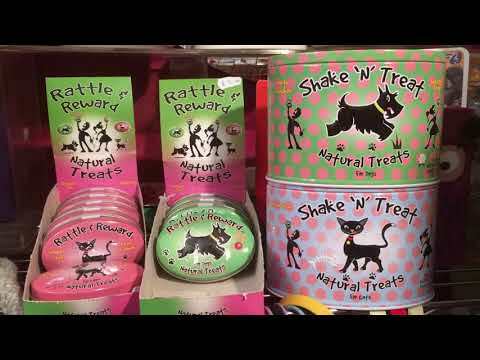 They are one of the only companies in the UK selling natural, grain-free Pet Treats in a tin. Sales began in September 2017 and the company is growing fast. David would like to add pouches to their range. Each pouch will contain four times as many dog and cat treats. You can Fund the production of Rattle & Reward's first 10,000 pouches here. You'll become a Friend of the brand and can earn a 6.0% profit in just 4 months. Rattle & Reward successfully raised £8,000 to fund the production of 10,000 pouches 532 days ago. Check back soon for more offers. "I don’t want to shoot myself in the foot, but I have to say we came across this brilliant idea just by accident! At the time I was supplying 5,000 tins of sweets per week to Tesco all over the UK. We noticed our pets liked the noise of the tins and so we’d rattle them and then give our cat bits of ham or chicken. Rattle & Reward was born!" David is a sales professional, having previously distributed brands of chewing gum, mints, speciality food and pet products in the UK and overseas. "Today, the market is booming! Natural and grain free and interesting packaging/brands are hugely in demand. Yes, there are several players, but the market is considerable and our brand is achieving good rates of sale and repeat purchase." Perfect for training, or just everyday treats! Based on David's previous work as a food distributor/agent, David is confident that sales of Rattle & Reward will exceed £5,000/month by March 2018, split between export and domestic sales. R&R Exports Ltd officially began selling in September this year and is now selling £1.5-2,000/month through 70 UK stockists. This is growing by 10 stockists per week and David also has plans to sell the product through major distributors in Europe and South Africa. Rattle & Reward's proposal is to raise £8,000 from PrimeStox to fund the production of 10,000 pouches. The filled pouches will secure the funding. David believes that pouches are the key to taking the company's sales to the next level and consumers and retailers have repeatedly asked for them. They will be sold at the same recommended retail price as the tins (£1.99) and will contain four times more treats (120g). They will also refill the tins. David is offering you repayment in 4 months, plus 6.0% profit. 6.0% absolute / 19% annual equiv.